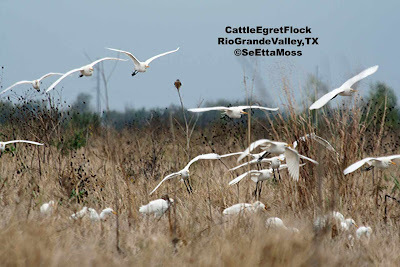 These are a few of my pics of birds in the Rio Grande Valley I took a few weeks ago. Though we see Cattle Egrets in Colorado, I don't usually get the opportunity to get within 75 feet of a feeding flock like this one. They would forage then something would disturb them and they would fly a little further to feed again. As can be seen in these pics, I wasn't seen as a big threat as this flock was flying generally towards me.